"Homeland" might have got the gender of its fictional president wrong, but as usual, the sixth season of the Showtime series -- which concluded Sunday -- also got plenty right in weaving real-world threads into its storyline, while still delivering the taut attributes of a thriller. More than most shows in the genre, "Homeland" operates in gray areas, avoiding facile solutions or easy answers. Where most dramas preoccupied with terrorism gravitate toward the good and bad, this one often deals in murky choices between the lesser of two evils. That was abundantly true of the season finale, which saw the end of what amounted to a coup attempt against the president-elect (Elizabeth Marvel) and a thwarted assassination plot. What followed, however, also validated concerns that she would overreach as president, flashing forward to the sweeping purge undertaken in response to those events. The payoff left the program's heroine, Carrie Mathison (Claire Danes), who ostensibly had the president's ear, at a professional and personal crossroads. With the series already renewed for two more seasons, it also sets up several tantalizing prospects as the show presumably arcs toward its finish. The finale's narrative twists capped a season dominated by a clandestine war between the incoming administration and the intelligence community. As a bonus, it also featured an elaborate "fake news" operation conducted with the latter's blessing, run by a bombastic talk personality clearly intended to resemble Infowars' Alex Jones. 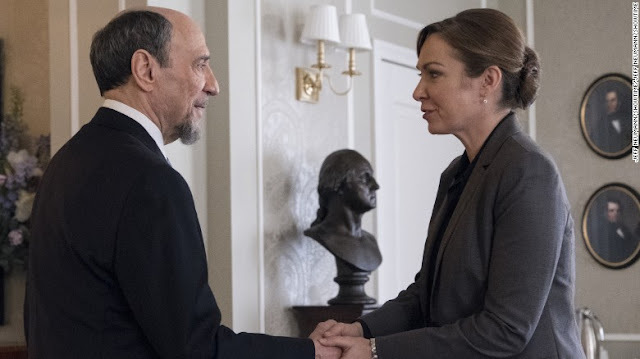 Under Dar Adal (F. Murray Abraham, in his most expansive work for the show to date), the CIA fretted about the new Commander in Chief gutting its operations. Those forces went so far as to frame a Muslim-American youth with a provocative online footprint in a terrorist attack, in what might be a construed as a reaction to legitimate criticism of "Homeland's" past depictions of Muslims as terrorists. All that built toward Sunday's finale, in which the orchestrated attempt on the president's life resulted in the sacrifice of Carrie's longtime associate, Peter Quinn (Rupert Friend), in order to save her. "Ultimately, I lost control of what I set in motion," Dar Adal told CIA colleague Saul Berenson (Mandy Patinkin), a line that neatly described the frequent "Homeland" theme of unintended consequences. The producers have discussed that they were roughly halfway through writing the season when Donald Trump was elected president, suddenly casting their efforts into a different light. As executive producer Alex Gansa noted, "things have gotten even more contentious between Trump and the intelligence community, which is what our whole season was about crazily enough." Alas, not everything else about the sixth season worked equally well. Quinn's emotional fate came after an extended subplot dealing with the stroke he suffered in staving off a terror threat, and while a sympathetic figure, that felt more like a distraction from the main themes than an addition to it. Quinn has always provided a window into Carrie's conflicted soul, but much of the drama surrounding them simply felt strained. That included Carrie potentially losing custody of her child, a rather manipulative way to showcase the difficulty of work-life balance when the gig is in counter-terrorism. Those missteps, however, played like relatively minor flaws in a season that proved compulsively watchable -- one that has set events in motion that should whet appetites for what's to come more than any recent "Homeland" edition. As Claire Danes’ Carrie Mathison grapples with the new world order in President Elizabeth Keane’s Washington, her longtime compatriot Peter Quinn (Rupert Friend) went out in a heroic blaze of glory, rescuing Keane from the convoluted, Dar Adal (F. Murray Abraham)-orchestrated conspiracy that drove the season. “Do what I say,” Quinn tells Carrie in his last words. She does. He drives the President’s black SUV through a hail of bullets to get Carrie and Keane to safety on a Midtown side street. Ever the highly trained special ops pro, he manages to ease the vehicle over to a gentle bump into a parked car before expiring in the driver’s seat. By the end of “America First,” Quinn was dead, Dar was in jail, Saul had been arrested, Max was hung over, Franny was still in foster care and Keane appeared to have morphed into something of a cross between a Manchurian candidate and a Stepford wife. Carrie in the final minutes realizes that she’s been played by a paranoid President to help facilitate a witch hunt and purge of the national security establishment. Just when Carrie thought she finally had some respect from the power structure in Washington, she gets hustled out by security. This last twist is an appropriate ending to a season that mined the drama of our national mood of disunity and distrust. The influence of fake news and the covert agenda of the “deep state” is a source of mental anguish for the left and the right. More than ever, politics is conducted in echo chambers that we construct for ourselves via self-selected news and information feeds. This makes the other side seem like the screaming banshees that freaked out Keane. Before Keane is rattled to the core by the assassination attempt, Saul Berenson (Mandy Patinkin) tells her that she is seen as a threat in a divided nation because of her independent streak and willingness to up-end the status quo. “You’re a bad dream,” he says. “You’re not controlled from within.” She admits to him she may not be “sure” about her ability to lead in such a fractured and dysfunctional political environment. By the end of the hour, we are left to believe that Keane’s traumas this season have led her to be willingly co-opted by a new group of handlers. The arrests of Saul and other CIA vets are part of a Stalin-esque purge — the exact conditions that Carrie, in her role as White House “liaison” to the intelligence community — swore would never happen. “This has nothing to do with the conspiracy — this is payback pure and simple,” Carrie tells the new White House guy, David Wellington, who has Keane’s ear. What’s the use of White House clearance if Carrie can’t keep Saul from getting arrested? There were moments that pushed the credibility envelope in the finale in service of the plot. Could Adal really kidnap a U.S. Senator and persuade the maitre’d of a swanky restaurant to stash him, naked and shivering, in the deep freeze? Would the Secret Service really buy Carrie’s explanation that the conspiracy was to get Keane out of the hotel in order to kill her? When did the rogue Delta forcers settle on Quinn as the target of an unhinged military vet to frame for the assassination of Keane — something that was apparently beyond the scope of Adal’s plan? “Ultimately, I lost control of what I set in motion,” Adal tells Saul. He also delivers a line that, coupled with the twist at the end, seems like it is planting seeds for season 7 with Keane still in the mix. But “Homeland” can mostly be forgiven for its fantastical leaps in service of its plot. Since season one in 2011, no series on the air has worked harder to present a real-time mirror on the realpolitik of the post-9/11 world. To paraphrase Saul in his conversation with Keane, what “Homeland” does each season takes balls. People like a show with balls. Hard as it was to watch Quinn die, it makes sense for the show. Quinn already cheated certain death in season 5. Better to burn out than to fade away. Quinn made a Quinn-tessentially courageous decision to sacrifice himself when he realized he had no choice but to drive straight into his death in order to save Carrie and Keane. Quinn may have chastised Carrie for her laser focus on “the mission, the mission, the mission,” but Quinn was hard-wired to serve. Carrie’s inability to really grieve for Quinn until she finds the pictures of his son, and her, tucked into his well-worn copy of “Great Expectations,” was a nice moment. Rupert Friend should not be forgotten come Emmy time. There was no mistaking the references to the worries raised by the Trump administration’s policy of favoring “economic nationalism” and concerns that Trump’s campaign rhetoric has emboldened the public display racist attitudes. The title “America First” is a Trump-ian reference. So was the racial slur used by the covert ops bad guy Gen. McClendon behind the kill-the-President plot. In a reference to the Senator with a Hispanic surname who faced the Big Chill, McClendon tells Dar: “You think I’d give that oily f— the time of day?” Chilling. Another Lesli Linka Glatter-directed “Homeland” finale gave us some teeth-gritting moments of tension. Keane and Carrie trying to outrun the rogue gunmen in the hotel was one. So was the question of whether a drunken Max eruption would derail Carrie’s home visit with the social worker that holds the key to her reuniting with Franny. Claire Danes. Scene for scene, episode for episode, there is no actor who works harder than Danes does in this show. She is a national hero. Spoiler alert: The following story contains significant details from Sunday’s Season 6 finale of Showtime’s Homeland. In the end, there was nothing gray about Peter Quinn's departure from Homeland. The author of so many nefarious deeds done in the name of his country died a clear-cut hero. Although Sunday's Season 6 finale dealt with a presidential assassination attempt and the prospect of an internal government coup (One Sunday in April sure feels like Seven Days in May), fans of Showtime's intelligence thriller will always remember it for the passing of Quinn (Rupert Friend), a killing machine troubled by having a soul. That Quinn survived last season's nerve-gas poisoning and a subsequent stroke initially seemed a stretch, but the character showed that, even hampered by psychological and physical issues, he still was more capable than most. More important, Friend's portrayal illustrated the sadness and loneliness of Quinn, who loved but could not have colleague Carrie Mathison (Claire Danes). But let's get to the events that resulted in Quinn's goodbye at the close of a season that improved as it went along, shifting from perceived outside threats to real internal ones. The first half of Sunday’s season finale is action film, with intrepid Carrie and stalwart Quinn rushing to President-Elect Keane's New York hotel, hoping to fend off an assassination attempt by a government paramilitary unit. At the same time, CIA prince of darkness Dar Adal (F. Murray Abraham), who’s in on the conspiracy to destroy Keane’s presidency but apparently not to kill her, is doing a little enhanced interrogation of his own, chaining a U.S. senator in a restaurant refrigerator to find out why Quinn is being set up to take the fall for the assassination. Dar, one of TV’s great villains, reveals a scintilla of humanity when it comes to his one-time recruit, Peter. He loves him and he’s not going to let him be used. You think you know someone, huh? As Carrie and Quinn get back to the hotel, it’s surrounded by angry protesters, perhaps stirred up by the fake social-media army created by TV hothead and conspiracy theorist Brett O’Keefe (Jake Weber), who's been working with Dar to undermine Keane. Carrie goes inside the hotel; Peter scouts events from the street. Gen. McClendon (Robert Knepper) and his assassination unit report a bomb in the hotel as a way to flush the president onto the street. Even Dar can't persuade him to stop. After two armored SUVs leave the hotel's garage, Carrie steps in the way of the third, which contains Keane, after Dar calls and tells her of the assassination set-up just before one of the vans blows up outside. Carrie and Keane hurry through the building, seeking to evade McClendon's murderous operatives, before meeting Quinn, who ushers them back into the SUV. He drives from the garage and floors the vehicle toward an armed phalanx, getting his own Bonnie-and-Clyde moment as a barrage of bullets shatters the van's protective windshield. (The covert assassination attempt went on a bit long, losing all elements of secrecy along the way.). Quinn, hit in the process, speeds away before losing consciousness and hitting a car. Carrie, protecting the president in the back seat, discovers he is dead. The second half of the finale, less violent but just as scary, jumps six weeks into the future, with Keane in the Oval Office; conspirators, including Dar, in military jail; and O'Keefe still free and ranting to listeners about the president's expansion of the Patriot Act. Saul visits an imprisoned Dar, who still suspects the president but admits he overstepped. "It was never my intention for things to turn so dark. Ultimately, I lost control of what I set in motion." Wit Homeland renewed for two more seasons, we hope — and expect, considering his shady skills — that this isn't the last we see of Dar. After the child-services officer awards her high marks for a home visit, Carrie finally starts to clean up Quinn's gear. She finds a stash of his most beloved photos, including some of his rarely discussed son, John Jr., and the boy's mother — and one of Carrie. She breaks down. Later, Saul calls, shocking Carrie with the news that he and other intelligence officials are being arrested. Apparently, the government takeover is now based in the Oval Office, as Keane, likely spooked by the assassination attempt and media attacks on her late war-hero son, is using NSA data and favorable Justice Department legal opinions to clean out government officials she suspects were part of the conspiracy. As Carrie, feeling used, shouts from outside the Oval Office, Keane sits alone within. Carrie, escorted out of the White House by the Secret Service, ends the season looking at the U.S. Capitol, echoing a view seen by long-gone POW Nicholas Brody, confused for very different reasons, in the first-season opening credits. Carrie wonders if she knows her country. She looks like she's about to cry. 0 Response to "'Homeland' pays off headline-fueled season with taut finale"